Hi all! I’ve been so busy in the craft room this past month I’ve barely had time to sleep let alone write up some great new posts for you! One thing that’s been keeping me busy is the exciting Fabri-Quilt New Block Hop coming up the first week of September! I’m joined again by the wonderful Yvonne of Quilting Jetgirl, Stephanie from Late Night Quilter and Cheryl form Meadow Mist designs. 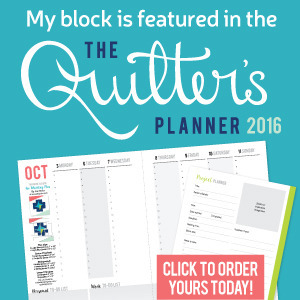 I worked with those ladies on the 2015 New Quilt Blogger’s Blog Hop. Every day from August 31 to September 3rd we, along with over 50 of our dearest blogging friends will be bringing you block tutorials for fun blocks we’ve designed specifically for our color palette, Watermelon Summer! Fabri-Quilt so generously donated fat 8ths to all the hop participants and afterwards we are going to have 3 fabulous quilts to donate to charity built from the blocks we created in all of our tutorials! I’m so excited to finish up my tutorial for all of you and to see what the other groups are whipping up too! PS. There will be more sneak peeks on what’s been keeping me so busy lately along with an update on my sailboat wall hanging and much more! Hahaha Tish, sometimes I feel like the pile might come to life and actually consume me too! Hope you weren’t too concerned. I’ve been busy with 99% good things but some are a bit secret so I can’t share them yet but I’m counting down the days till I can, just gotta line up all these duckies first!